The Field Museum of Natural History, located along Chicago's Lake Shore Drive on the shores of Lake Michigan, is a treasure trove of archeological artifacts, zoological and botanical specimens, and exhibits about geology and scientific method and discovery. The Field Museum, opened in 1893, is one of the world's most complete natural history museums. The Field Museum is named for the museum's first benefactor, Chicago retailer Marshal Field. Founded to house the accumulated artifacts on display for the 1893 World Exposition, the museum quickly outgrew its first quarters and moved to its present site in 1921. Today, the museum, with the adjacent Adler Planetarium and John G. Shedd Aquarium, is the one of the city's most popular visitor attractions. How Tall Is the Ferris Wheel at Navy Pier? The Field Museum has been featured in several movies, including the 1997 film, "The Relic," and the 1996 film, "Ghost and the Darkness." The Field Museum's permanent exhibits are divided into four major sections: Anthropology, Zoology, Botany, and Geology. The most popular exhibit is "Sue," the oldest and most complete skeleton of a Tyrannosaurus Rex known to be in existence. The dinosaur skeleton (pictured at right) is 42' long and 13' high. Her skull, too heavy to be attached to the rest of her frame, is housed on an upper floor. Other highlights of the museum include its large taxidermy collection; the extensive anthropology exhibit; the Grainger Hall of Gems, with its large jade collection and Louis Comfort Tiffany window; and the "Underground Adventure," which "shrinks" visitors to the size of a penny so that they can explore the world from the eyes of an insect. The museum also houses a large research library, with over 250,000 volumes. In addition to the extensive permanent collection, the Field Museum hosts a regular schedule of temporary exhibits. Recent shows have included "Tutankhamen: the Golden Age of the Pharaohs," "Trash to Treasure: Salvage from the Great Chicago Fire," and "Insects: 105 Years of Collecting." Some of the special exhibits carry an additional admission charge. The Field Museum is centrally located, along the Lake Michigan shore on Chicago's Lake Shore Drive, and easily accessible from all parts of the city. The museum is open every day, expect for Christmas Day, from 9am to 5pm, with the last admission at 4pm. Admission is $12 for adults and $7 for children ages one through four, students, and seniors. Chicago residents receive a $2 discount on adult admission and $1 discount on child/student/senior admissions. Parking is available at the several lots surrounding the museum for $15. Facilities at the Field Museum include a McDonald's and a Corner Bakery as well as a fascinating gift shop, stocked with toys, cards, gifts, and books. 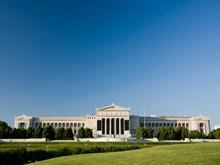 Nearby sights include Soldiers Field, home of the Chicago Bears; the Adler Planetarium; and the John G. Shedd Aquarium.